Collective Blog: Aid: Who gets credit? Logos are one way aid agencies claim recognition, but what do they mean to the populations they serve? During our work in communities, I often encounter very interesting myths about where development aid comes from. In 2004, when I was working on a project on social protection programmes in Sindh, I spoke to a government official affiliated with the Zakat-Ushr and Baitulmal programmes. He believed that the funding source for these programmes was “Maal-e-Ghanimat” sent to Pakistan by the Saudi government. In other words, he thought the state programmes were funded by income generated from booty accumulated during wars fought at the time of the Prophet Muhammad, which was donated to the country’s poor by Saudi Arabia. After the 2010 floods in Pakistan, we were conducting a survey on food insecurity and found little to no acknowledgement of the aid provided by the government, key aid agencies or international bodies for rescue and relief work. Most respondents believed that the work was done and funded by the Pakistan Army and NGOs. Another interesting misconception was around the Benazir Income Support Programme (BISP), an unconditional cash transfer programme for Pakistani women living in extreme poverty. The stipends from the programme were often referred to as “Benazir’s Money,” with a common (erroneous) assumption that the financial assistance given is generated from Shaheed Benazir Bhutto’s life insurance deposits, and not state and multilateral aid. These misconceptions could be coming from how charity is commonly understood in Pakistan. The religious philanthropic mind-set permeates the local psyche. Different religious traditions encourage or mandate helping the less fortunate. The New Testament contrasts the earthly life of the rich man and the beggar with the reversal of their fortunes after death, and implies that the rich who fail to help the poor will end up in hell. In Buddhism, giving is one of the primary tenets of practice, with generosity seen as one of the essential attributes of a superior person. Islam also obligates a compulsory charity (zakat) on anyone who can afford it. In all of these traditions, the donor gives to increase their favour with a higher power, and therefore does not need any other acknowledgement. In Pakistan, the state has often used this idea to gather funds for countering poverty. For example, anyone with savings, profit or loss sharing accounts with a balance of over 340 USD faces deductions for charitable contributions on the first of Ramazan. These funds are used without publicly crediting the donor. The anonymity inherent in the religious paradigm of giving could influence the way development assistance is understood in Pakistan. Having said that, there could be other more political reasons for these misconceptions as well. Where international donors funnel aid through local intermediaries and civil society organisations, organizations have to operate strategically with all actors involved. They pose to be close to the state while aligning more closely with other development and political agendas. Sometimes, reasons such as local resistance against foreign aid, the law and order situation, and local norms lead to local intermediaries maintaining a distance from their international donors. However, confusion on the field about where aid comes from may result in a lack of accountability around the use of development assistance. If the donors continue to get no credit, they may be less inclined to give money in the future. Most importantly, the government not getting credit for its work may lead to increased disillusionment with the state at the community level. 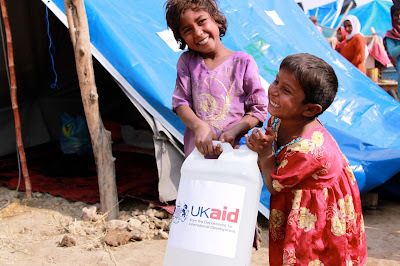 A clear communication of who gives aid will help.